- Newton: The Making of Genius by Patricia Fara (Columbia University Press, 2004). Harvard Bookstore. - Anna Letitia Barbauld: Voice of the Enlightenment by William McCarthy (Johns Hopkins University Press, 2008). Brattle. - Peter's War: A New England Slave Boy and the American Revolution by Joyce Lee Malcolm (Yale University Press, 2009). Brattle. - The Club Dumas by Arturo Perez-Reverte (Harcourt Brace, 1996). Brattle. Grabbed a hardback of one of my favorites. - The Richmond Times-Dispatch report has further quotes from Maine archivist David Cheever: "We are very disappointed. I'm just sorry they reached the decision they did. It seems like a bit of a stretch, but we waged a good fight, they prevailed." He said he did not believe the town would seek to buy back the broadside: "To buy it back when it's something that we think belongs in the public realm anyway would be a decision that Wiscasset might make, but one I would not recommend. I would be more apt to encourage Mr. Adams to donate it back to the town." - A Washington Post piece by Fredrick Kunkle features the first reaction from the attorney for Richard Adams, whose claim to the Declaration is now quieted: "We're very pleased with the ruling. It's what we hoped." And more from Cheever, who said that this decision "only inflames a sense in Maine that too much of its history has been raided by out-of-state collectors. 'Here's somebody from 'away' who comes in and finds something of value,' Cheever said. 'Because it's the Declaration of Independence, the hair on the back of the neck stands up. This shouldn't be leaving.'" - And in the Portland Press-Herald report, assistant state attorney general Thomas Knowlton: "We are extremely disappointed in the decision, we strongly disagree with the court's interpretation of the law and its application of the law to these facts." There really is a book about everything. Tony Perrottet's Napoleon's Privates: 2,500 Years of History Unzipped (HarperEntertainment) examines the never-ending trend of popes (or politicians, or businessmen, or kings and queens) behaving badly, offering a catalog of prurience coupled with puns (mostly fairly bad, but often amusing anyway). There is, at least, a bit of historical mythbusting, and each section does offer a decent list of sources for further reading, should you be so inclined. The bookish angle, of course, is the old story that a certain bit of Napoleon, lopped off at autopsy, was once in the possession of the great Philadelphia bookman A. S. W. Rosenbach (and later in the collection of the insatiable collector of the macabre John Lattimer, to whom Perrottet dedicates his book). Useful (aside from the obvious conversation-piece factor) for its examinations of grist from the historical rumor mill. As expected, the Virginia Supreme Court ruled today that collector Richard Adams, Jr. can keep his copy of a 1776 Declaration of Independence broadside (Salem: E. Russell) claimed by the state of Maine. I've posted background on the case here, and the most recent news we had was from when the case was argued before the state Supreme Court back in January. In a 19-page ruling [PDF], the court upheld a trial court's February 2008 decision that Maine had no right to the document, since the state had failed to prove that the Declaration had ever officially been a town record. Maine's state archivist, David Cheever, said he found the court's ruling "incredible," adding "To us, it's a public document. It was then. It is now. ... The unfortunate result is a public record that we believe rightfully belongs to the people of Maine is now in the hands of a private collector in Virginia." Adams' attorney successfully argued that the town clerk's copy of the Declaration made in the town record books serves as the "official" record, since the Massachusetts Executive Council's order accompanying the Declaration "directed the town clerks to record the Declaration’s text in their respective town record books 'to remain as a perpetual Memorial thereof.' Neither the Executive Council’s order nor any other law directed the town clerks regarding the proper disposition of the broadsides after their contents were transcribed in the town record books." The supreme court agreed with the trial court that the broadside "did not meet the common law definition of a 'public record' because a public officer did not create the print." They write: "The fact that the Executive Council authorized Russell to print the broadsides did not transform his employment status from that of a private printer to one of a public officer. Russell was not executing the duties of public office at the time he printed the broadsides. ... the duty of the town’s clerk to create a public record of the Declaration emanated from the Executive Council’s order directing that the clerks of the various towns record the text of the Declaration in their town books 'there to remain as a perpetual Memorial thereof.' This order of the Executive Council reflected the importance of the clerks’ acts of transcription and the fact that the written entries they created were to be the perpetual record of the Declaration in the various town books." Finally, the court refuses to examine the question of whether the fact that the Declaration was found in the home of a former town clerk means that it was unlawfully removed from the town's possession (and thus could be returned even if it wasn't a 'public record'). So that's it for this case. There is no further appeal. I've spent parts of the last couple Thursday mornings at the Center for the History of Medicine at Harvard's Countway Library of Medicine. They have a few very interesting library catalogs that I've been scoping out as possible additions to the Libraries of Early America project, and I'll probably be spending some more significant time there later in the spring. Among the items of interest are an 1816 manuscript catalog of the first Boston Medical Library (founded in 1805) and an 1823 printed catalog of their library. One of the founders of the Boston Medical Library was Dr. John Collins Warren (1788-1856), whose two-volume library catalog from 1830 delighted me immensely. One volume is organized by author, giving full bibliographic details about the books (we like those). The other volume is organized by subject, using a very extensive classification system (presumably devised by Warren himself). Jefferson's is the only other early American library I can think of offhand where such a scheme is deployed. A third item of particular interest is the library catalog of Dr. John Jeffries (1744-1819), a Boston physician who served as a surgeon with the British army during the Revolution and lived in England until the late 1780s. While there he made several voyages by balloon, including one across the English Channel. He returned to Boston and lived out his days as a prominent medical figure in Boston. His books, or at least the medical portion of them, were left to his sons at his death, and a catalog was made of them. Later, some of the books were donated to Harvard Medical School, the Boston Medical Department, and the Boston Public Library. The Jeffries catalog is almost entirely medical books, some with, um, interesting names, like "Directions for ruptured persons" (which I presume is something like this title). I'm excited to add some medical libraries to the project, and very thankful to the Center's public services librarian, Jack Eckert, for making me aware of these catalogs. I'm sure I'll have more to say about them soon when I've dived in a bit deeper. All programs are affected, and managers are taking a 10% pay reduction as part of the overall reductions. In 2009, there will be no pay increases for staff or management. The Trustees concentrated most of the staffing reductions in the research library in order to preserve and focus on public access to museum exhibits and educational programs and to continue web-based services, traveling exhibits, and school outreach programs across the state. 'The reduction in expenses will allow us to focus on excellent core programs that serve more than 50,000 Oregonians each year,' said George Vogt, Executive Director. Public access to the library collections will necessarily be limited after mid-March, and the Society will post information, including hours and condition of access, on the website shortly. The Society will continue to provide access to photographic and film collections and will continue to partner with Oregon Public Broadcasting in the production of Oregon Experience. We urge everyone to contact his or her state legislators with messages of support for the Oregon Historical Society’s appropriation." Book Review: "Exploits and Adventures of Brigadier Gerard"
You know Sherlock Holmes. You may even know Professor Challenger. But do you know Brigadier Etienne Gerard, the hero of eighteen short stories by Sir Arthur Conan Doyle? His Exploits and Adventures are collected in an NYRB classics edition (2001), and if you're in the mood for some humorous little stories of gallantry under fire, I recommend them highly. Gerard, a plucky little cavalryman serving under his beloved Napoleon, may not always understand what's going on around him (the Emperor himself notes "I believe that if he has the thickest head he has also the stoutest heart in my army"), but he will always try his best to do what he thinks is expected of him (which is, usually, exactly the opposite of what really is expected of him). In his introduction to the volume George MacDonald Fraser calls Brigadier Gerard Conan Doyle's "most likable and most human" character, and the brazen hussar certainly deserves both of those descriptors. It's impossible not to laugh at his misreadings of situations, his inability to withstand a pretty face, and his unwavering commitment to the cause of his Emperor. Finding a new Conan Doyle character is always a delight; finding one as amusing as Brigadier Gerard is a rare treat indeed. Some really shocking and rotten news out of Portland, OR this afternoon: due to budget cuts, the Oregon Historical Society will be closing its research library as of this Saturday, 28 February. The library, which has existed since 1899, houses the largest collection of archival documents related to the history of Oregon, including "more than 32,000 books, 25,000 maps, 12,500 linear feet of manuscripts, 4,000 serials titles, 6,000 vertical files, 18,000 reels of newspaper microfilm, 8.5 million feet of film and videotape, 10,000 oral history tapes, and more than 2.5 million photographs." The library will be closed to the public after the 28th of this month, and current positions are being eliminated beginning on 13 March; some staff will be retained to manage photograph and film reproduction orders. No word on when or if the library will reopen, or what will happen to its collections. I suppose it's high time I discuss Robert Darnton's 12 February NYRB piece "Google & the Future of Books," and the various responses it's elicited. I've been letting this one percolate for a while, (as I guess I tend to do with Darnton essays). Darnton, the head of Harvard's library system, begins by pointing out the simple, key fact about the Google Books settlement: it's extremely long and incredibly complicated (as Caleb found out when he tried to navigate through it), so nobody really knows yet what the heck it all means or what the long-term implications are for anyone (Google, publishers, authors, libraries, users, &c.). He continues by looking back to the great 18th-century notion of the Republic of Letters (in which "the realities of literary life contradicted the lofty ideals") and casting an eye to the present (in which much-lengthened copyright protections have brought us to a "world designed by Mickey Mouse, read in tooth and claw"). Calling out the publishers of academic journals for their blatantly extortive practices (my word, not his), and noting that the cost of an annual subscription to the Journal of Comparative Neurology now costs $25,910(! ), Darnton concludes that this highway robbery has created "ripple effects [which] have damaged intellectual life throughout the world of learning." But, he says, there is a glimmer of hope in the emerging models of open access: "The democratization of knowledge now seems to be at our fingertips. We can make the Enlightenment ideal come to life in reality." Or can we? Darnton says that commercialization may be the wrench in the works: "To digitize collections and then sell the product in ways that fail to guarantee wide access would be to repeat the mistake that was made when publishers exploited the market for scholarly journals, but on a much greater scale, for it would turn the Internet into an instrument for privatizing knowledge that belongs to the public sphere." Libraries must digitize materials, he argues, "But not on any terms. We must do it in the interest of the public, and that means holding the digitizers responsible to the citizenry." Darnton goes on to examine the Google Books project and the proposed settlement between it and the author/publisher community and what that settlement may mean for libraries and for users: a grand possibility for what would truly be the largest library in the world, but worrisome because of the de facto monopoly it would grant Google over the digitization of books covered by American copyright law. He makes the important point that American libraries missed their chance in the 1990s to band together with foundations and create a National Digital Library: "It is too late now. Not only have we failed to realize that possibility, but, even worse, we are allowing a question of public policy - the control of access to information - to be determined by private lawsuit." The effective monopoly which Google will hold if the settlement is approved, Darnton writes, should concern us all even though Google has thus far operated in a way that seems fair and appropriate. "What will happen if its current leaders sell the company or retire? ", Darnton muses, adding "The public will discover the answer from the prices that the future Google charges." Yes, he admits, having an "immense corpus of digitized books" available is a great thing, but "this is a tipping point in the development of what we call the information society. If we get the balance wrong at this moment, private interests may outweigh the public good for the forseeable future, and the Enlightenment dream may be as elusive as ever." I suspect Darnton is right to suggest that the ship has probably sailed on copyright-covered materials, since it seems fairly unlikely that a judge will throw out the settlement or change it in any substantial way. However, I also think that there is still a key place for non-profit, open-access efforts like those run by the Internet Archive - and frankly, Harvard's participation and/or leadership in those efforts wouldn't be a bad thing. There are several elements of Darnton's argument and the Google Books settlement which bear considering. The fact that they'll be making the great mass of copyrighted-but-out-of-print materials available digitally is great (for most): as Thomas Augst notes in a NYTimes piece on Darnton's essay, this increased availability of material will begin "leveling distinctions" between circulating libraries and research libraries, many of which are still difficult to gain access to (ahem, including some of the Harvard libraries). Even for a small fee, being able to quickly access (and search!) across this vast sea of text will be a boon to researchers around the world. I do hope, however, that if Google goes ahead with this plan, they will find a way to incorporate bricks-and-mortar booksellers into the equation: some customers (myself included) may wish to purchase hard copies of titles even if they are available via Google, and those customers should be able to easily locate one (by a link to ABE or ViaLibri, perhaps, although it's not clear whether the settlement will allow that). Google's making such an option available would speak loudly about its avowed purpose of not being out to make money but to provide information and access options. Darnton's argument that a Google-based monopoly over out-of-print books violates the "information wants to be free" ideal (which he expresses even more forcefully in an NPR interview) isn't bad, or wrong, but he fails to offer any constructive alternatives. If any institution could lead digitization in a different direction it's Harvard, but Darnton does not lay out a scheme for that. If he's got one up his sleeve, I'd love to hear it. In his essay he begins to make an important point (that copyright protections shouldn't be as practically infinite as they currently are), and perhaps that's a springboard. If he wants to lead a movement to push back against the Mickey Mouse Protection Act and its ill-begotten progeny I'll happily take to the barricades with him, but under current law I'm not sure there's a better solution than what Google and the authors have reached (provided that things go off generally as envisioned). Another of Darnton's threads to follow is the "don't digitize only to limit access" idea. Sarah Werner discusses this in a post at Wynken de Worde, writing: "As a scholar of early modern books, I have to wonder, how do we democratize those? Do we just agitate for free EEBO, Early English Books Online for everyone everywhere? Will those books be read? Will those books be understood? Every semester I see my students interact with early printed texts for the first time and initially, they can hardly make sense of what they are looking at. Why do they mix up their i's and j's? Why are there f's instead of s's? Why can't they spell? What's that word down there at the bottom of the page and where are the page numbers?! Libraries, digital and otherwise, make texts available. But it is teachers who enable them to be read. Scanning all the books in the world won't make a Digital Republic of Learning if we don't value reading and learning in the first place. " Reading and learning (and teaching) must be valued, there can be no dispute about that. And I don't expect expensive databases like EEBO, ECCO, Digital Evans, &c. to suddenly be free and available. But I certainly wish they could be. Sure, there might be people who don't get every nuance of what they see (opening up a great opportunity for those of us who can help in that regard to provide contextual details). But not having access to them severely limits scholarship, especially for those of us who are no longer students and don't happen to work at places that can afford access to all of them). Leadership from Harvard and other major research libraries on that front could help too; a clamor for open access to such resources would go a long way toward making it happen. Darnton's goals and aims are laudable, and I'm glad he's taken a broad view and has neither wholly embraced nor scorned the Google settlement. The issues he raises are important, and I hope that his essay will spur a wide debate throughout the library community about its continued role in the new digital world. As he says, the one thing we cannot to is sit back and watch as the world changes around us, because if we do that, we'll find ourselves in a world we played no role in creating. A couple of interesting library-world developments in recent days. - Tim notes the release of an Association of Research Libraries (ARL) report on the proposed (now delayed) changes to OCLC usage policies. The report is decidedly opposed to the scheme set forth by OCLC and urges a "fresh start." - Earlier this month, a group of key law school librarians released a statement calling for all American law schools to cease print publication of print law journals in favor of "stable, open, digital formats." Twenty-one signatures have been obtained this far. 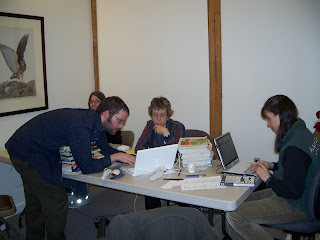 Yesterday's LibraryThing cataloging-party at the Audubon Society of Rhode Island headquarters went off really nicely. In just a few hours, about fifteen LT volunteers (from all over New England) and three ASRI staff entered the approximately 2,500 books in the circulating collection and a separate teaching collection, creating a full LT catalog for the library complete with tags and call number info. It's a neat collection of natural history books, field guides (for birds, mammals, plants, even millipedes!) and other relevant titles, so it was fun to work with in that sense, and it was really great to see old friends and make new ones, including meeting several folks who I've corresponded with often. The staff at the center was great, providing refreshments and guidance on their collection as we entered the books. Among the many pleasures of the day were getting to see other people using LT and seeing the number of ways in which people interact with the site, including some volunteers who hadn't used LT before (and who got a walk-through from none other than the founder of the site himself!). Those of us who use it every day got a chance to chat and debate about all sorts of plans and features too, which is always fun. Some more pictures here, and I'm sure Tim will post later about the party as well. - Laura has some great finds for us this week: she discovered the outdoor shooting location for the very amusing British show "Black Books," and she's posted the first installment of some of the things she's finding in her research on the evolution of images in anatomy books from 1450 to 1800. - The Folger Library recently unveiled PLRE.Folger, a site designed to complement the ongoing Private Libraries in Renaissance England project. "PLRE.Folger contains records of nearly 13,000 books drawn from book-lists compiled in England between 1507 and 1653, itemizing the collections of 196 owners." - Speaking of other non-LT "reading databases," The Little Professor test-drives GladCAT for us: this is a collection of annotations and marginalia in the books read by William Gladstone. - Caleb Crain found a great Franklin quote amongst his reviews. Also this week, Caleb posted an excellent piece on the Google Books proposed settlement. - In the TLS, Mary Beard asks "what made the Greeks laugh?" - Jim Watts has a fascinating little video on Bach's personal Bible, highlighting its amazing provenance. - On the OUPBlog, author David Post has a short essay on his new book Jefferson's Moose, which is on my list of books to read. - Nick Basbanes posts on the art of the book-dealer catalog, mentioning a few excellent recent examples. I'll add one I really enjoyed recently: Justin Croft's Catalogue Five, which was a delight to read. Nick also wrote recently about bookshops and other bookish activities on Cape Cod. - Richard Cox has a must-read essay about the major issues of leadership in the archival community. - On CBS Sunday Morning recently, a piece on French bibliomaniacs. Wonderful. - It's that time again: the shortlist for the Oddest Title is out. Finalists include Curbside Consultation of the Colon, 2009-2014 World Outlook for 60-milligram Containers of Fromage Frais, and Baboon Metaphysics. The winner will be announced 27 March (you can vote here). - Michael Lieberman points out some great new bookish podcasts for your listening pleasure. He also notes a fascinating new project begun by the ABAA: an oral history project in which Michael Ginsburg and others interview book dealers at various fairs. This will be great! - David King comments on the next forthcoming J.R.R. Tolkien book, a collection of Norse myths (arriving in May). - I think I've posted this before but anyway, Reading Copy passes along a list of twenty-five famous people who worked at one time as librarians. - In the NYTimes, Walter Kern reviews David Denby's Snark. - The Little Professor reviews Dan Simmons' Drood. - For the WSJ, Guy Darst reviews Urich Boser's The Gardner Heist. - We-Think: Mass Innovation, Not Mass Production by Charles Leadbeater (Profile Books, 2009). Profile Books. 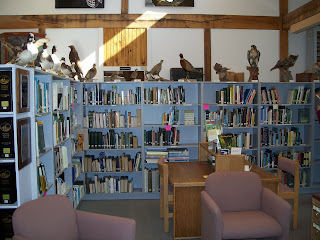 Headed down to Smithfield, RI today with the LT crew to flash-catalog the library at the Powder Mills Wildlife Refuge. Depending on time, may be doing a little live-Twittering from there, but will take the camera at least and post pictures later on. - Through today (sorry, I dropped the ball on this one) Sotheby's is exhibiting for private sale the Valmadonna Trust collection, described as the "finest private library of Hebrew books and manuscripts in the world. ... Now for the first time, the entire library of the Valmadonna Trust - some 13,000 printed books and manuscripts - will be on public exhibition, including the incomparable 12th-century manuscript Pentateuch, the earliest dated Hebrew codex written in England, as well as Daniel Bomberg's magnificent edition of the Babylonian Talmud, one of the great printed books of the Western World." News article from Bloomsbury on the collection. - Swann will hold a sale of Printed & Manuscript African Americana on 26 February. Highlights include a first edition of Phillis Wheatley's Poems on various subjects (1773) which seems to have been at one point in the collections of the Library of Congress - $20,000-30,000. - The Isaac Newton manuscripts up at Bonhams on 15 February appear not to have sold. - Bargains abounded at the Bloomsbury Bibliophile sale on 12 February. appreciative if you could let us know." "Contributions from the Museum of History and Technology Papers 59-64" - Chief Justice Warren Burger's copy, with his bookplate. Gordon, "Collecting Chinese Export Porcelain"
Hirschl & Adler Galleries, "From Architecture to Object"
Rothstein, "Woven Textile Design in Britain from 1750 to 1850"
Parry, "British Textiles from 1850 to 1900"
Hood, "Two Virginia Painters, 1735-1750"
Morley-Fletcher, "Antique Meissen Porcelain in Color"
Arias & Hirmer, "Le Vase Grec"
"Ralph Wood Pottery: Mr. Frank Partridge's Collection"
The Christian Science Monitor has a feature today on the use of reCaptcha technology for book digitization. I've mentioned this before, but this is the best summary I've seen of the project, which takes words from scanned books that OCR programs have difficulty with, and places them in those little "type these two words" boxes on secure sites. "Web users now provide about 3,000 man-hours a day of free labor in 10-second bursts of human computation, correcting more than 10 million words every day. ReCaptchas have solved 5 billion words in less than two years. Most people aren’t even aware that their brain power is being harnessed, although every reCaptcha includes a button that users can click to explain the program." The verified words are used in the Internet Archive's text versions of scanned books. As part of the new Fine Books universe, check out the brand new very shiny Fine Books Blog, which will feature occasional posts from yours truly, plus a whole bunch of my biblio-blogging counterparts. I have to come up with something flashy for my first post over there, any ideas? 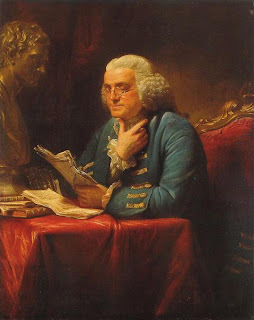 I can't tell you how many times I've questioned my own sanity in the last week, but I am more than a little delighted to report that Benjamin Franklin's library is now entirely entered into LT. All 3,742 titles of it. Some statistics are here, including info on languages (2,583 in English, 906 in French, 207 in Latin, plus some in Italian, German, and a few other tongues), and other interesting bits. As you can see, the last couple months have been busy ones: one other volunteer and I have entered 2,009 of the titles just since 1 January, and ~800 of them in the last ten days (hence the questioning of the sanity). This project wouldn't have been possible without the hard work and gracious permission of both Kevin Hayes, the American Philosophical Society and the Library Company of Philadelphia, the author and publishers of The Library of Benjamin Franklin (Philadelphia: American Philosophical Society, 2006). Not only have they made the book available via Google Books (here), but they also gave us permission to enter the data from it completely, including the wonderful and incredibly useful annotations. - The scrubs of Parnassus or, all in the wrong by Whackum Smackum, Esq. - A book of common prayer stolen from Franklin's church pew. Franklin put an ad in the paper reading in part: "The Person who took it, is desir'd to open it and read the Eighth Commandment, and afterwards return in into the same Pew again; upon which no further Notice will be taken." - John Whitehurst's An inquiry into the original state and formation of the earth, about which another correspondent wrote to see if BF had received the book: "Mr Whitehurst desired me to ask you if his book was got to your hands he sent it by some Compte or other whose Name I forget." Anyway, an interesting news item today: a local t.v. station in upstate New York had reported on the sale of the 1864 Lincoln manuscript speech last week from the perspective of the selling institution (the Southworth Library in Dryden, NY). Trustees decided to sell the document to fund building renovations and add to the library's endowment. The 1864 Lincoln speech was given to Dryden congressman John Dwight in 1916 by Lincoln's son Robert; Dwight's widow donated it to the library. Book Review: "The Founders on the Founders"
Documentary editor John Kaminski's The Founders on the Founders: Word Portraits from the Revolutionary Era (U. Virginia Press, 2008) is a commonplace book of quotations by and about members of the founding generation about themselves: Kaminski writes that he "collected references to character, mannerisms, physical and intellectual descriptions, and everyday activities but avoided references to political issues. I wanted to put flesh and blood on these people whose personalities we knew little or nothing about" (p. ix). Thirty people are covered in this volume, from the usual suspects (Washington, Adams, Jefferson, Franklin, Hamilton, Madison) to the slighty-less-usual suspects (Henry Knox, Oliver Ellsworth, Roger Sherman, James Wilson, John Jay). If you know your history there's probably no one in this book you haven't at least heard of, but I suspect you may find something new about them in these pages. Kaminski has drawn on the Adamses, both John and Abigail, for a fair number of his quotations - the duo wrote often and at length about their contemporaries, and true to form held little back. John's pen tended to prick most sharply, which makes his words all the more interesting for us. His portrayals of Burr (p. 90), Franklin (p. 163, 165), and Hamilton (p. 213) are typically biting. William Pierce's sketches of his colleagues at the Constitutional Convention also find their way into the book, as do the observations of foreign observers like Luigi Castiglioni, Louis Guillaume Otto, and the Marquis de Chastellux. Other major sources are the writings of Jefferson, Franklin, Madison and Washington. A fascinating book to read through, and a good source for quotations on its subjects. There is one serious fault, however, which I feel compelled to mention: that is a lack of source notes for the quotations included. This is a most unfortunate omission. While Kaminski notes in his preface that many have been taken from the published documentary editions of the Founders' correspondence, no specific footnotes have been made available. For those in search of a more complete contextual picture than the snippet quotations provided here, simple references would have been invaluable (or at least saved some time). On 30 April 1756, 20-year old John Adams wrote in his diary "A hazy, dull Day. Reading Milton. That mans Soul, it seems to me, was distended as wide as Creation. His Powr over the human mind was absolute and unlimited. His Genius was great beyond Conception, and his Learning without Bounds. I can only gaze at him with astonishment, without comprehending the vast Compass of his Capacity." Sounds about right. I've been enjoying Paradise Lost for several weekends now, in the recent Modern Library edition (William Kerrigan, John Rumrich and Stephen Fallon, eds.). Each Saturday and Sunday morning I went out into the kitchen, away from the computer and other technological gadgetry, to read without distraction. Milton both deserves and demands this treatment, I found: the poem is complicated enough that to try and read it any other way would have been impossible, and it is brilliant enough that I wanted to savor it to the fullest. The editorial introduction provided a good and thorough background into aspects of Milton's work, including brief discussions of the poem's publishing history, the author's worldview, the linguistic styles and effects deployed in Paradise List, and the critical controversies the work spawned. Beyond this, the unobtrusive but more than welcome footnotes throughout were very helpful. I'll spare the plot details, since they are well known (if not to you, try here or here). What most impressed me about Milton's tale was his utterly brilliant use of the English language. The cadence and the rhythm of his words held me in thrall from start to finish; there were times when I couldn't help but read the lines out loud to hear the way the words rolled together, sometimes striking against each other, sometimes merging so gracefully it seemed almost musical. His depictions of the fall of Satan and his minions and their re-emergence in Hell is riveting: the language is beautiful, but the imagery is positively terrifying. Fully deserving of its reputation. A poem to wonder at, by an author to gaze at with astonishment. Motoko Rich continues her NYTimes series on "The Future of Reading" with a piece today on school librarians (aka those in the field most likely to deserve sainthood nominations). I think it's a good article: it points out the important roles school librarians can play in teaching students not only about the pleasures of readings, but also about Internet research skills, lessons they may not be getting either at home or in their test-obsessed classroom instruction. Rich also touches on the trouble spot, however - that librarians tend to be easy targets for budget cutters. What is true for all librarians is perhaps even more immediate for school librarians: today's libraries aren't just books anymore. Being able to understand, manage and train students to use a wide (and ever-expanding) range of resources has become part and parcel of school librarianship; unfortunately in too many school districts, the list of priorities has gotten a little out of whack. The librarian profiled by Rich told her "We are teaching them how to think. But sometimes the Board of Ed seems to want them to learn how to fill in little bubbles." Book Review: "The Last Witch of Langenburg"
At long last, a microhistory done right! The Last Witch of Langenburg, by Thomas Robisheaux (W.W. Norton, 2009), is the rare book which manages to actually do what microhistories are supposed to do: use an individual case to "illustrate the function of the formal institutions in power and how they handle people’s affairs." In his preface Robisheaux says that he "wanted to use the narrative potential in microhistory to explore the multiple layers of experience and meaning important to understanding witchcraft" (p. 13). Taking Anna Elisabeth Schmieg, a miller's wife accused of (and executed for) witchcraft in the German village of Hürden in the early 1670s, as his focal point, Robisheaux uses her richly-documented case to examine a tremendous variety of cultural and societal elements which played a role in the way she was treated by those who handled the accusations against her. Among these: the region's tense political and religious history, the role of millers in local society, local customs and superstitions, the backgrounds of local officials (including the court advisor, ministers, doctors and others), and so forth. At the very moment when religious, legal and scientific worldviews were shifting in key ways, this case captures those changes to such an extent that it seems almost uncanny. From the court advisor's request for a "second opinion" from the law faculty of a university in another city when the first doesn't give him the answer he wants to the remote diagnosis of arsenic poisoning based solely on a description of the symptoms, Robisheaux manages to capture how these paradigm-shifts played into the Schmieg case in integral ways, shaping how the evidence was handled, how the suspect was treated at trial, and what happened after her execution. Perhaps even more importantly, Robisheax takes the archival evidence of Schmieg's case and creates from a narrative that reads easily, like a good novel. Even the discourses of legal and scientific arcana are melded nicely into the book's narrative structure, and do not in any way take away from the flow of the story (in fact, I would go so far as to say that they enhance the book tremendously). One of the best histories of witchcraft I've read, right up there with Mary Beth Norton's In the Devil's Snare. Barbara Hodgson's Hippolyte's Island (Chronicle Books, 2001), is a delight. I picked it up for the illustrations (lovely maps, drawings, natural history specimens, &c.), and half-expected the text to be nothing special. But I quickly found myself drawn into the story, in which the decidedly unorthodox protagonist Hippolyte Webb decides to go in search of the Aurora Islands, a mythical[?] mini-archipelago in the South Atlantic 'discovered' in 1762 and sporadically from then until 1862, but not observed since. Hodgson uses Webb to spin a lively and fascinating web (heh) of a tale as we see him learn to sail, make his trek, and then try to convince his New York editor (along with everyone else, including the reader) that he's not barking mad. Using conventional narrative along with other devices (publishing-house memos, handwritten drafts, log excerpts), the book is paced well, and designed excellently. A bit more character development wouldn't have gone amiss - while we get to know Webb fairly well, the others he meets along the way remain a bit sketchy. Perhaps that's intended, though. Either way, a fun read, with a fascinating quest at its heart. - If you're looking for something bookish to do next Saturday, LT's hosting another Flash-Mob Cataloging Party, at the Audubon Society of Rhode Island's Powder Mill Ledges Wildlife Refuge in Smithfield. Full info here. I'm going. You should too! - The ABAA's San Francisco fair is going on this weekend. Coverage in the San Francisco Chronicle includes a top-line mention of our friend Ian Kahn (whose books arrived on time after all - whew!). - Members of the Jeffersonville Carnegie Library Foundation, which oversees the Remnant Trust collection currently housed in Jefferson, KY, said this week that they are confident they can find a way to keep the collection where it is, problems with its present location notwithstanding. - The Walters Art Museum in Baltimore has mounted an exhibit relating to the St. John's Bible, an ongoing project to create the "first handwritten, illuminated Bible to be commissioned by a Benedictine monastery since the advent of the printing press more than 500 years ago." The Bible is scheduled for completion next year. - More than 24,000 pages of the papers of former first lady Bess Wallace Truman were opened to the public 13 February at the Truman Presidential Library and Museum, to mark the 124th anniversary of Mrs. Truman's birth. No bombshell revelations were reported. - Paul Collins notes his Slate piece on CBS' "The Big-Bang Theory" and the question of whether Sheldon has Asperger's syndrome. - Blood traces on a couch believed to be the very piece of furniture on which author Alexander Pushkin died are being tested to be determine if they're the real thing. Carolyn Kellogg has more at Jacket Copy. - Scott Douglas has a new "Dispatches from a Public Librarian" up at McSweeney's. - Carolyn Kellogg also pointed us this week to the Catalogue of Digitized Medieval Manuscripts, a very decent and usefully-searchable database of manuscripts made available online by libraries around the world. I like it! Kellogg is right to note that link-collections are tricky, since URLs tend to be less stable than they should be, but hey, it's better than nothing. - The NYPL blog this week mentioned Premiere Issues, a site designed to archive "first issues" of magazines. It contains about 200 issues, mostly fairly recent (within the last twenty years or so). With wider coverage this could be extremely useful. - In the TLS, Richard Dawkins reviews Jerry Coyne's Why Evolution is True. He calls the book "outstandingly good," and concludes "The need was great; the execution is superb. Please read it." Given the recent poll numbers, it's hard not to agree. - Coyne's book is reviewed alongside Desmond and Moore's Darwin's Sacred Cause by Thomas Hayden in the WaPo. - Dan Simmons' Drood is reviewed by Robert Hughes for the WSJ. - Lauren Groff's new collection of short stories, Delicate Edible Birds, is reviewed at Open Letters. - Costica Bradatan reviews Ingrid Rowland's Giordano Bruno: Philosopher/Heretic in the Philly Inquirer. - The Leatherstocking Tales I: The Pioneers, The Last of the Mohicans, The Prairie by James Fenimore Cooper and The Leatherstocking Tales II: The Pathfinder, The Deerslayer by James Fenimore Cooper (Library of America, 1985). - Bleak House by Charles Dickens (Book-of-the-Month Club, 1998). - Henry Fielding: A Life by Martin C. Battestin (Routledge, 1993). - Essays on Education in the Early Republic; edited by Frederick Rudolph (Harvard University Press, 1965). - Dictionary Johnson: Samuel Johnson's Middle Years by James Lowry Clifford (Heinemann, 1979). - The History of the Library in Western Civilization: From Minos to Cleopatra by Konstantinos Staikos (Oak Knoll, 2003). I'll have more later today (I finally finished a couple of books last night so I've those to review, and I'm yet to make a planned pilgrimage to the Brattle this morning) but for the moment, I wanted to note that among the Franklin books I added to LT this morning was this one: Good things to come; or, A setting forth some of the great things that will contemporize and take place when our Lord Christ shall come again mentioned in the Holy Scriptures (London, 1645) by one Praise-God Barebone (or Barbon), who I offered up this dispatch on way back in July 2007. Aside from the big Lincoln sale at Christie's yesterday, there were also some big prices realized among the Print and Manuscript Americana lots. - The Stone Broadside Declaration of Independence on parchment made $698,500; it was sold to a private buyer in the United States. The paper proof went for $68,500. - An unpublished scientific manuscript by Albert Einstein on unified field theory fetched $230,500. It sold to a book dealer from Europe. - John Adams' 1813 letter to William Plumer discussing the events of early July 1776 sold for $206,500. Today's Christie's sale of Abraham Lincoln's 1864 victory speech set what various media outlets are calling a new record for the highest price paid for an American historical document (by which they apparently mean manuscript document). The speech sold for just over $3.44 million to an anonymous telephone bidder. Christie's revealed that the speech was sold by the Southworth Library Association in Dryden, NY, which plans to use the proceeds to build a new wing. More on the other Christie's results tomorrow morning. - "With Hayseed in My Hair": Abraham Lincoln and Massachusetts, an exhibit at the Massachusetts Historical Society. Opens today, and will be open Monday-Saturday, 1:00 PM to 4:00 PM through 30 April. - "Harvard's Lincoln," an exhibit in the Edison and Newman Room and Harvard's Houghton Library. Open until 25 April during Houghton's regular hours. - "'There is grandeur in this view of life': The Origin of Species at 150", an exhibit in Houghton's Amy Lowell room. Open until 28 March during Houghton's regular hours. reference for those readers who are not completely fluent in German and/or Italian. This work is divided into two language sections, German and Italian, with English translations. Each section contains a brief description the language's use of abbreviations, followed by a list of entries with the uses of the German or Italian word and its corresponding English translation. In addition, each entry includes at least one example in order to provide the context in which the abbreviations could be used." booksellers and existing dictionaries in addition to his own knowledge. Approximately seven hundred entries are provided, each containing the French, English, German, and Italian translation. This book also provides a glossary of commonly used terms in all four languages." Accused Shakespeare Folio thief Raymond Scott made another court appearance today in Consett, England, where his lawyers argued that the case should be moved to London for trial. Scott told the Northern Echo "I’m advised it would be in my interests to have it moved – that it would be very difficult to get a jury that hasn’t been saturated in the news coverage. I don’t think it (the case) will go very far. Fair England, justice for all and all that sort of thing, but it’s just not cricket." Scott arrived at court in another chauffeured limo, wearing a "Boss Hogg" outfit ("brown leather jacket, white T-shirt, white trousers, white shoes, brown sunglasses and gold chain") and carrying his now-trademark cigar and Pot Noodle dish. The AP reports that he "read aloud from Shakespeare's Richard III before entering the court." He did not enter a plea, and will next appear in crown court on 14 April (until which time he's out on bail). After the appearance he went all Hamlet on reporters as he complained that the wheels of justice aren't turning fast enough: "Like Hamlet, Prince of Denmark, I have had to suffer not only the whips and scorns of time but also the law's delay." The Press Association report of today's events notes: "Scott faces a total of six charges, including stealing the book and an alternative charge of handling stolen goods. He also faces four other separate charges of theft and handling stolen goods relating to a driving licence, credit cards and a personal organiser found at an address in Ayton, Washington, Tyne and Wear, last summer." Paul Collins catches a neat story in the 4 February NYTimes, about a new novel in the form of an auction catalog. The idea for Leanne Shapton's Important Artifacts and Personal Property From the Collection of Lenore Doolan and Harold Morris, Including Books, Street Fashion, and Jewelry (just out from Farrar, Straus and Giroux), "came to her because she noticed how the lot descriptions in some estate catalogs added up to elliptical plots about the lives of the former possessors," Randy Kennedy writes in the Times story. A fascinating twist on the genre, but of course as Paul Collins points out, fictional auction catalogs are nothing new: he finds a 1790 satirical book auction catalog (that I am now hunting for a copy of! ), and mentions the online version of Fortsas' catalog, in which I played a minor role. - Bonhams and Butterfields (San Francisco) will hold a Fine Books & Manuscripts sale on 15 February. Highlights include several Isaac Newton manuscripts. - Bloomsbury London will hold a Bibliophile Sale on 12 February and a sale of Children's Books, Private Press/Limited Editions, Artist Books and Modern Illustrated Books on 26 February. The New York branch will host a Modern Posters and Bibliophile Sale on 25 February. - Christies will sell Print and Manuscript Americana on 12 February, including a Stone Declaration of Independence on parchment ($400,000-600,000) and a third paper proof of the Stone printing ($70,000-90,000). There's also an 1813 John Adams letter to Gov. William Plumer, in which the former president (not entirely accurately) recounts the events of early July 1776 ($200,000-300,000). - In a separate sale, also on 12 February, Christies will sell the manuscript of Abraham Lincoln's 1864 election night victory speech, delivered from the White House window. This is estimated at $3-4 million. - In the Boston Globe, Erin McKean profiles the strange and ever-evolving Twitterverse (I will say, it's much more addictive than I thought it would be). - A cabinet of Alfred Russel Wallace's biological specimens has turned up in a D.C. lawyer's home, the Washington Post notes today. - Ian (among others) pointed out Save the Words this week: an effort to get little-used words into normal conversation. - Rick Ring reports a really neat find at the Providence Public Library: a piece of the shirt collar of Maj. Sullivan Ballou, whose famous final letter to his wife Sarah was featured so prominently on Ken Burns' Civil War documentary (and has become forever linked to the beautiful "Ashokan Farewell" music in my head). - Nick Basbanes recommends two new Darwin books to read for the bicentennial, and mourns the loss of Ron Ravneberg, a famed collector of James Cook materials and a founding member of the Aldus Society. - Reading Copy notes the discovery of a Library of Congress book at the John F. Kennedy Library; Kennedy had checked out the book (a biography of Lincoln) while a senator and never returned it. The book will be displayed at the JFK Library through Presidents' Day, and then will be returned to DLC. - Tim has some stats on where LT's records come from and how they're used. Good stuff. - The American Historical Review has rejected the controversial article criticizing Stanley Kutler's published version of the Nixon tapes. In a response to the author, AHR editor Robert Schneider said that the essay, "despite its intrinsic interest, is too narrow in focus for this publication. ... Essays must therefore reach beyond the issues, concerns or jargon of a particular sub-field and speak to larger theoretical, methodological, or substantive issues. It seems to us that your essay is more appropriately placed in a more specialized journal." Author Peter Klingman told the NYTimes he is considering what steps to take next. - Laura has an account of her recent trip to Antwerp, where she visited the Plantin-Moretus Museum. Sounds like a great trip, and the pictures are beautiful! - J.L. Bell throws a little cold water on the "hot Martha Washington" item I mentioned earlier this week. Bell's also begun a new series of CSI:Colonial Boston in recent days, and continues to uncover intriguing things. - GalleyCat lists some good publisher blogs. - Chris catches a great library story: the pilot who ditched his plane in the Hudson had a library book in his luggage, and the library has not only agreed to waive the replacement costs, but has dedicated the new copy to Mr. Sullenberger. - Former Manhattan prosecutor turned crime novelist Linda Fairstein has turned to recent map theft cases for her latest book, Lethal Legacy, in which the thief is called Eddy Forbes (and is based in part on E. Forbes Smiley). - Rare Book Review notes a new gimmick from the BL: an adopt-a-book scheme centered on Valentine's Day. - In the NYTimes, Blake Wilson has some "Stray Questions" for Steven Johnson, in which he comments briefly on his use of Google Books for his most recent book, The Invention of Air. - In the LATimes, M.G. Lord reviews a whole slew of new books on Darwin (and some whacky offshoots of his ideas). - Geert Jan van Gelder reviews the first full translation of the Arabian Nights since Richard Burton's - a three-volume Penguin edition featuring the translations Malcolm C. Lyons, with Ursula Lyons; the tales are introduced and annotated by Robert Irwin. - Walter Olson reviews David Liss' Whiskey Rebels in the NYTimes. - Steven Gunn reviews several new books on Henry VIII as the 500th anniversary of his accession approaches. - For the Times, Roy Hattersley reviews Doris Kearns Goodwin's Team of Rivals. - In the NYRB, Frank Kermode reviews a trio of new Milton biographies. - Richard Cox reviews Ann Laura Stoler's Across the Archival Grain and Peter Charles Hoffer's The Historian's Paradox. A large construction vehicle toppled over and crashed into the small parking lot near to the Brattle Book Shop on West Street in Boston this morning, wreaking havoc on the shop's bargain shelves/carts and injuring two construction workers, one of whom fell from the bucket as the vehicle went down. No new arrivals this week. The Royal College of Arms, a central London institution which houses the "coats of arms and pedigrees of English, Welsh, Northern Irish and Commonwealth families and their descendants," along with related genealogical materials, was badly damaged by fire on Thursday morning, but none of the historic documents or library materials kept at the College are believed to have been damaged in the blaze. There were no injuries. Next Thursday I'm giving a talk to a Simmons class about women and reading during the colonial period; in doing some research for that I discovered some additional inventories of women's libraries, so I thought I'd take a brief break from Ben Franklin and add one of those to the Libraries of Early America project. Sarah Willoughby (1639-1672) was the wife of planter and militia Lt.-Col. Thomas Willoughby of Lower Norfolk, Virginia. Unlike her husband's books (which are captured in the inventory of his estate - taken just a few months before Sarah's - only as "a pcell [parcel] of books"), Sarah's are mostly itemized, giving us some insight into her reading habits. Religion and associated topics form the core of the collection, as one would expect: there are at least five bibles (one in folio, two in quarto, one in Latin, and two New Testaments) and several common books of devotional material, sermons, &c. There are also several histories and books on agriculture, navigation, medicine, grammar and other utilitarian topics. There is little in the way of literature, although several works by Ovid appear, as do Aesop's fables and one Virgil title. Slightly less than 90% of the works are in English, the rest in Latin. This inventory, like many others, seems to have been created by one person calling out titles and another recording them. That always makes for some tricky identifications (I often have to say titles out loud to see if I can reshape them): "Sonds his travells," for example, turned out to be Sandys' Travels, while "ovids deartia Mundy" morphed into Ovid's De arte amandi). Thankfully wildcard searching with ESTC and WorldCat tends to work pretty well at sussing out results. There were a few titles I didn't manage to puzzle out ("arsmetias in octavio," "plain prime,") so if anybody has any suggestions on those I'm all ears. Nine people have been arrested in northern Cyprus for the theft of what has been described as a 2,000-year old Syrian Orthodox Bible, believed smuggled into Cyprus from southeastern Turkey. Police intercepted the Bible at a bus terminal on Friday before it could be sold to a (presumably waiting) buyer. Authorities said that a "Christian prayer statue and a carving of Christ were found in the Karpas village home of one of the suspects. Five sticks of dynamite were also found, which police believe were to be used for later excavations by the suspects." The smuggler and another suspect fled the bus terminal during the raid and remain at large. Book Review: "The Archimedes Codex"
No, The Archimedes Codex is not - blessedly - one of the growing number of DaVinci Code clone-novels, but rather a really intriguing look into the inner workings of the Archimedes Palimpsest project, an effort (begun more than 10 years ago now) to recover and understand the works contained in what surely must now be the most famous palimpsest in existence. Co-written (in alternating chapters) by project manager William Noel (a curator at the Walters Museum in Baltimore) and Reviel Netz (a Stanford professor of classics and philosophy), the book recounts the troubled past and revealing present of the manuscript codex, offering up a good book history story as well as interesting looks and explanations of how the discoveries being made with the use of the codex are changing our understanding of ancient math and science. It is not often that such a revealing portrait of the process behind a major research project like this are made public in this way, which makes this book all the more interesting. I really enjoyed learning how very decisions came to be taken as various conservation and imaging processes were carried out on the book so that it could give up its secrets. And, dense as they were, Netz' chapters on Archimedean mathematics were written with sufficient clarity that even I managed to understand them. The entire project, which has resulted in any number of conventional-wisdom-changing discoveries, has fascinated me for quite a while; my first post on it was way back in August 2006, just a few weeks after I started blogging here. I've added several more since, as new findings have been released. Most recently, I noted the release of the full dataset, which will (and presumably already has) allowed other scholars to find still more secrets of the palimpsest. Enjoyable and fun to read - the enthusiasm Noel and Netz exude is contagious, even through the printed page. Book Review: "Angels & Insects"
A. S. Byatt's Angels & Insects contains two separate and unconnected novellas: "Morpho Eugenia" and "The Conjugial Angel." The first is Byatt at close to her best, and the second, unfortunately, was just about the opposite for me. In "Morpho," she explores the strange ways of a secluded Victorian family, weaving natural history into the mix in a really fascinating way (as she did with some of the pieces in her The Biographer's Tale). The heady mix of religion, science, and good old-fashioned ant-watching made this story a good read. "Angel," however, is Byam at her most meta. Far too much digression and linguistic flummery for my liking. I got bored and wanted to quit. I'm sure others who enjoy this style more will enjoy the second portion of the book far more than I did. More than 150,000 historic maps collected by David Rumsey are being donated to Stanford University, along with digital surrogates and the database Rumsey has created to made the maps accessible online. The first batch of 20 has already been turned over to the university's special collections department, with more to follow. Rumsey said "Stanford is a pioneer in the digital library world. When I was thinking of who to give my collection to, I wanted to ensure the preservation not only of the original materials but also the digital copies I made. I knew Stanford would be the best place for them." He said he hopes that his example will encourage other donors to give original documents and digital copies at the same time. The database (which I have used often and found excellent) currently contains more than 18,500 images, and Rumsey says he'd like to add up to 5,000 more each year. The February issue of Fine Books Notes is out today. It includes a great piece by Nick Basbanes on a book which shaped Abe Lincoln's life, and you'll also find my first column for the magazine, about Hakimzadeh's thefts from the BL and the Bodleian. I'll be writing there on book crimes every second month. Former head of the Antiquarian Booksellers Association David Slade was sentenced this afternoon to a prison term of twenty-eight months for the theft of books from the library of Sir Evelyn de Rothschild. A report in The Times reveals some of the titles in question: "Among the books put up for auction between 2003 and 2007 [at Dominic Winter] were a Chaucer title sold for £15,000, another book entitled Voyages from Athens to Constantinople, which fetched £33,000, and four gospels that sold for £21,000. In addition an autographed 1st edition of Seven Pillars of Wisdom by TE Lawrence was auctioned for £22,000." Slade pleaded guilty to stealing the books during a period when he'd been hired to catalog the collection. The thefts were later discovered when the collection was inventoried. Judge Christopher Tyrer told Slade "There was no question of you having any permission to remove them. Instead what you indulged in was significant plundering of Sir Evelyn’s books and did so over a significant period of time and in flagrant breach of the employment you had undertaken. "Judge Tyrer also ordered that the unsold books be returned and that the Lawrence title be returned by its purchaser. No word on the other titles which were sold. Slade's attorney told the court "David Slade is nearing his 60th birthday and is a ruined man and he knows it. He faces losing at least £100,000 of his assets and it is of deepest shame to him and his family that he is here. At a time when most men his age are looking forward to retirement he knows he faces financial ruin and a prison sentence." He claimed that Slade's actions were motivated by a desire to pay down credit card debt. It's hard to say anything about this case other than wow. - In the Washington Post yesterday, Brigid Schulte wrote on Martha Washington's new look, helped along by a new portrait of the first First Lady created by forensic anthropologists at the Louisiana State University Forensic Anthropology and Computer Enhancement Services (FACES) Lab. "These are the scientists who do age progressions to determine what kidnapped children might look like as adults. [Historian Patricia] Brady asked whether they could do the same process in reverse: take a middle-aged Martha and, using her bone structure, figure out what she would have looked like as a 25-year-old about to marry the future father of the country." Using a miniature on ivory believed to be an accurate likeness of Martha, the anthropologists created the new image, which Mount Vernon officials liked so well that they had a portrait made which is now hanging in their Visitor Center. - Divers for Florida-based Odyssey Marine Exploration say they've found the wreck of H.M.S. Victory, a British warship which sank in 1744. More than 900 men and a fortune in gold (as much as four tons of the stuff) went down with the ship, plus as many as 110 bronze cannon (some of which have been used to identify the wreck). The company has released an analysis [PDF] of the wreck containing the evidence for its identification as the Victory, and they are "in negotiations" with the British Defense Ministry to arrange for recovery/disposition of the wreck. The Guardian's crime correspondent, Sandra Laville, has a column today on library thefts, including updates on William Simon Jacques (aka still on the run) and Farhad Hakimzadeh, plus some new news about a case which had slipped under my radar, that of David Slade. Slade, 59, is the former head of the ABA and a longtime antiquarian book dealer in England. He stole 68 books from the collections of financier Sir Evelyn de Rothschild (he'd been hired to catalogue the collection and swiped the items on the sly), and sold them at auction. He pled guilty after Rothschild discovered the books were missing during an inventory. Laville points out that this case - and it's a doozy - has received "no publicity" to date, which is true, and regrettable. Laville: "Alan Shelley, current president [of the ABA], said the only way to eradicate the trafficking of rare books was to work closely with libraries, auctioneers and dealers. The British Library has led the way by admitting when it is the victim of theft. But while major international libraries alert each other to details of stolen books or descriptions of thieves, these do not always reach the antiquarian book trade and not all libraries are honest about falling victim to theft. 'We all need to be a bit more grown up,' said Jolyon Hudson, from Pickering and Chatto antiquarian bookseller. '[Libraries] are the curators of the nation's knowledge, and when they lose it they are somewhat embarrassed to admit that.'" All fair points, and all reasons that those of us who work hard to make these cases public do what we do. Auction houses and book dealers must do a more thorough job of checking provenance, and must report suspicious items when they are offered for sale. Libraries and all other institutions must speak out when they've been robbed, and must follow through on the cases and carry them to completion. Collectors must also be watchful of what they're purchasing - even when it's from reputable dealers - and follow up on any suspicious items offered or purchased. Most importantly, all three groups must talk to each other. But the media also plays a role here: The Guardian reaches a whole lot more people than my posts do, so it cannot just be dealers, auctioneers, librarians and collectors who talk about these matters amongst themselves (although that is a terribly important component). Laville and her counterparts at other news organizations should take these thefts as seriously as we do, and write about them more often. If the international media publicized cultural crimes more often and in more depth, not only would more thieves be captured, but judges and legislatures would take notice and enact the penalties these criminals deserve. There is no quick fix to the problem. As long as there are books and libraries, there will always be book thieves. Those of us charged with the protection of our cultural heritage must, indeed, raise our voices still louder to demand strong punishments for who seek to steal and damage. But we cannot do it alone.